For other people with the same name, see Cadwaladr (name). The red dragon, which was attributed as a badge referring to Cadwaladr during the High Middle Ages. Cadwaladr ap Cadwallon (also spelled Cadwalader or Cadwallader in English) was king of Gwynedd in Wales from around AD 655 to 682. Two devastating plagues happened during his reign, one in 664 and the other in 682; he himself was a victim of the second. Little else is known of his reign. Though little is known about the historical Cadwaladr, he became a mythical redeemer figure in Welsh culture. He is a prominent character in the romantic stories of Geoffrey of Monmouth, where he is portrayed as the last in an ancient line to hold the title King of Britain. In Geoffrey's account, he does not die of plague. He renounces his throne in 688 to become a pilgrim, in response to a prophecy that his sacrifice of personal power will bring about a future victory of the Britons over the Anglo-Saxons. Geoffrey's story of Cadwaladr's prophecy and trip to Rome is believed to be an embellishment of the events in the life of Cædwalla of Wessex, whom Geoffrey mistakenly conflated with Cadwaladr. Cædwalla renounced his throne and travelled to Rome in 688. For later Welsh commentators, the myth "provided a messianic hope for the future deliverance of Britain from the dominion of the Saxons". It was also used by both the Yorkist and Lancastrian factions during the Wars of the Roses to claim that their candidate would fulfil the prophecy by restoring the authentic lineage stemming from Cadwaladr. The red dragon (Welsh: Y Ddraig Goch) has long been known as a Welsh symbol, appearing in the Mabinogion, the Historia Brittonum, and the stories of Geoffrey of Monmouth. Since the accession of Henry VII to the English throne, it has often been referred to as "The Red Dragon of Cadwaladr". The association with Cadwaladr is a traditional one, without a firm historical provenance. A general map of Gwynedd showing the cantrefi. Cadwaladr was the son of a famous father, Cadwallon ap Cadfan, and the successor to King Cadafael. His name appears in the pedigrees of the Jesus College MS. 20 (as "Kadwaladyr vendigeit", or "Cadwaladr the Blessed"). Cadwaladr appears to have suffered a major military defeat at the hands of the West Saxons at Pinhoe near Exeter in 658. He is said to have been of a "peaceful and pious" temperament and to have patronised many churches. The church of Llangadwaldr in Anglesey identifies him as its founder. Cadwaladr's name appears as 'Catgualart' in a section of the Historia Brittonum, where it says he died of a dreadful mortality while he was king. The great plague of 664 is not noted in the Annales Cambriae, but Bede's description makes clear its impact in both Britain and Ireland, where its occurrence is also noted in the Irish Annals. The plague of 682 is not noted by Bede, but the Annales Cambriae note its occurrence in Britain and that Cadwaladr was one of its victims. Both the Annales Cambriae and the Irish Annals note the plague's impact in Ireland in 683, as do other sources. The genealogies in Jesus College MS. 20 and the Harleian genealogies give Cadwaladr as the son of Cadwallon and the father of Idwal Iwrch. Idwal, who fathered the later king Rhodri Molwynog, may have been his successor. Cadwaladr's name is invoked in a number of literary works such as in the Armes Prydein, an early 10th-century prophetic poem from the Book of Taliesin. While the poem's "Cadwaladr" is an emblematic figure, scholars have taken the view that the Cadwaladr of Armes Prydein refers to the historical son of Cadwallon, and that already at this stage he "played a messianic role" of some sort, but "its precise nature remains uncertain". He is typically paired with Conan Meriadoc, the founder of British settlements in Brittany. Conan and Cadwaladr are identified as warriors who will return to restore British power. Armes Prydein states that "the British shall be without their kingdom for many years and remain weak, until Conan in his chariot arrive from Brittany, and that revered leader of the Welsh, Cadwaladr." Another poem states "Spendour of Cadwaladr, shining and bright, defence of armies in desolate places. Truly he will come across the waves, the promise of prophecy in the beginning." According to Elissa R. Henken, Cadwaladr was well established as a "prophesied deliverer" of the Britons before Geoffrey's version of his life altered its ending. This may be because he was seen as the man who would carry forward the achievement of his father Cadwallon, the last great war leader of the Britons: "it is quite likely that the father and son became confused in folk memory, a fusion enhanced by Cadwaladr, whose name is a compound meaning 'battle-leader', also having assumed his father's epithet Bendigaid (Blessed)." Cadwaladr figures prominently in Geoffrey of Monmouth's romantic account of the Historia Regum Britanniae (English: History of the Kings of Britain). As such, the Cadwaladr of Geoffrey is a literary invention that used the name of a historical person to advance the plot of the story. In Book XII, Chapter XIV of the Historia, Cadwaladr is given as the last in a line of kings that began with Brutus of Troy. Chapters XV – XVIII have him leaving a depopulated Britain for Brittany, where the British people have resettled. Britain itself has been almost emptied by plague; for eleven years the country was "completely abandoned by all the Britons" except for parts of Wales. Cadwaladr is received as a guest by Alan Hir, King of Brittany. Taking advantage of the depopulation, the Saxons invite more of their countrymen to join them as soon as the plague abates. From this point they become completely dominant in Britain, and the British come to be called the "Welsh". At the same time, in Brittany, Cadwaladr intends to return to take back the island, and asks Alan to provide him with an army. The Breton king agrees, but Cadwaladr hears a prophetic voice which tells him that he must sacrifice personal power for the sake of his people. If he renounces the throne, his sacrifice will eventually lead to the restoration of British control of the island in the future, as predicted by Merlin to Vortigern: "the Voice added that, as a reward for its faithfulness, the British people would occupy the island again at some time in the future, once the appointed moment should come". Cadwaladr is told that if he lives a penitent life he will become a saint. His bones will be hidden to protect them. When his sacred bones are found and returned to Britain, the Britons (Welsh and Bretons) will be restored to full possession of their homeland. Cadwaladr and Alan then consult the prophecies of Merlin, and rejoice that this prediction will be fulfilled in future. He then travels to Rome as a pilgrim, where he dies in 689 after meeting the pope. Thus Cadwaladr becomes a messianic figure who sacrifices himself to redeem his people and restore them to their promised homeland. Cadwaladr's penitence assures his sainthood. His son Ivor and his nephew Ynyr return to Britain with an army, but, as predicted, are not successful in restoring British control of the island. Cadwallader shall summon Conan and make an alliance with Alban. Then there will be a great slaughter of the foreign-born and the rivers will flow with blood. Then the hills of Armorica [Brittany] will crumble and he will be crowned with the diadem of Brutus. Wales will be filled with joy and the oaks of Cornwall will flourish. The isle will be called by the name of Brutus and the occupation of foreigners will pass away. This seems to correspond to the pairing of Cadwaladr and Conan as restorers of Britain in Armes Pridyn. The merging of the Welsh and Breton peoples is linked to an alliance with "Alban" (which probably means Scotland: Alba). The occupation of the English will be at an end and Britain will be restored to its true identity as the territory of the descendents of Brutus of Troy. Henry VII's coat of arms, incorporating the "Red Dragon of Cadwallader"
During the Wars of the Roses the prophecies connected to Cadwaladr were used by various contenders as part of their claim to the throne. This was linked to the story of the struggle between the Red Dragon and the White Dragon, part of the myth of Merlin, interpreted as warring Celtic and Saxon peoples. Edward IV claimed to be restoring the authentic ancient lineage of Cadwaladr, thus fulfilling Merlin's prophecy of the victory of the red dragon. His chancellor gave a sermon asserting that "the British line, which perished with Cadwallader's exile in 689 was restored by the arrival of Edward the king prophesied by Merlin and others." 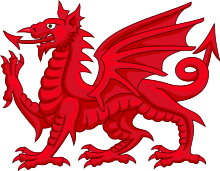 The Welsh Dragon (Red Dragon) was thereafter referred to as the "Red Dragon of Cadwallader" and used as Henry's personal emblem. Tudor historian Thomas Gardiner created a genealogical roll that gave Henry's son, Henry VIII, a pedigree showing his descent from Cadwaladr, referred to as "the laste kynge of that blode from whome by trew and lynyall descensse" the Tudors descended. Geoffrey's account of the pilgrimage of Cadwaladr is believed to derive from a confusion between Cadwaladr and his near-contemporary Cædwalla of Wessex (reigned 685 – 688). He also conflates Cadwaladr's son Ivor with Cædwalla's successor Ine. According to Bede Cædwalla, king of Wessex, renounced his throne and went to Rome in 688 to be baptised by the pope, dying soon afterwards. Ine took the throne in 689. The argument that Geoffrey confused Cadwaladr with Cædwalla acquired significance in the late 1570s. At that time, when St. Peter's in Rome was being rebuilt, the tombstone of Caedwalla was found, confirming Bede's story that he had died in Rome. Welshmen in Rome, seeking to validate Geoffrey, claimed that the tomb was that of Cadwaladr. This raised the prospect that his sacred bones could be returned to Britain in fulfilment of the prophecy. But herein appeareth the error of the British writers in taking one for another, by reason of resemblance of names, for where Ceadwalla king of the Westsaxons about that time moved of a religious devotion, after he was converted to the faith, went unto Rome, and was there baptised, or else confirmed of the foresaid pope Sergius, and shortly after departed this life in that city in the foresaid year of 689 or thereabouts. The Welshmen count him to be their Cadwallader: which to be true is very unlike by that which may be gathered out the learned writings of divers good and approved authors. Also traced to Geoffrey's fertile imagination are stories of Ivor ap Alan and Ynyr travelling from Brittany to Britain. The choice of names for Ivor and Ynyr in the stories may be a consequence of spurious additions to the Laws of Edward the Confessor, which inaccurately speak of good relations between Wessex and the Welsh in the reign of King Ine of Wessex (reigned 688 – 726). ^ Phillimore 1887:87 — he is in his descendant's pedigree, given as: ... Cynan tintaeth6y. M. Rodri mol6yna6c. M. Idwal I6rch. M. Kadwaladyr vendigeit. M. Katwalla6n. M. Kad6ga6n. M. Iago. M. Beli. M. Run hir. M. Maelg6n g6yned ..., and from there back to Cunedda. ^ John Cannon, The Oxford Companion to British History, Oxford University Press, Oxford, 1997, p.150. ^ Giles, J. A. (translator), ed. (1841), "III. The History", Nennius's History of the Britons, London: James Bohn , in Chapter 64. ^ Reeves, William, ed. (1857), "Additional Notes (Chronicon Hyense)", The Life of St. Columba, to which are added Copious Notes and Dissertations, Dublin: Irish Archaeological and Celtic Society, p. 376 — year 664, "Mortalitas magna in Hiberniam pervenit"
^ Phillimore 1888:159, Annales Cambriae, year 682, "Mortalitas magna fuit in brittannia. n qua catgualart filius catguolaum obiit." ^ Phillimore 1888:159, Annales Cambriae, year 683, "Mortalitas in hibernia." ^ Reeves, William, ed. (1857), "Additional Notes (Chronicon Hyense)", The Life of St. Columba, to which are added Copious Notes and Dissertations, Dublin: Irish Archaeological and Celtic Society, p. 376 — year 683, "Initium tertiae mortalitatis"
^ Phillimore 1887:87 — his pedigree is given as: ... Cynan tintaeth6y. M. Rodri mol6yna6c. M. Idwal I6rch. M. Kadwaladyr vendigeit. M. Katwalla6n. M. Kad6ga6n. M. Iago. M. Beli. M. Run hir. M. Maelg6n g6yned ..., and from there back to Cunedda. ^ Genealogies from Jesus College MS 20, Gwynedd 1. ^ Owen 1841:xiv, Pedigree of Ywain Son of Hywel, in the Preface of Ancient Laws and Institutes of Wales — his pedigree is given as: ... Rotri Map Mermin Map Ethil Merch Cinnan Map Rotri M. Tutgual M. Catgualart M. Catman M. Jacob ..., and from there back through Maelgwn Gwynedd to Cunedda and his ancestors. ^ Wright, Neil, "Geoffrey of Monmouth and Bede" in Arthurian Literature VI, Boydell & Brewer Ltd, 1992, p.27-60. ^ a b c Elissa R. Henken, National Redeemer: Owain Glyndŵr in Welsh Tradition, Cornell University Press, 1996, pp.29–32. ^ a b Faletra, Michael (ed), Geoffrey of Monmouth, History of the Kings of Britain, Broadview Press, 2007 p.134. ^ Hughes, Jonathan, "Politics and the occult at the Court of Edward IV", Princes and Princely Culture: 1450–1650, Brill, 2005, p.112-13. ^ Dobin, Howard, Merlin's Disciples: Prophecy, Poetry, and Power in Renaissance England, Stanford University Press, 1990, p.51. ^ D.R. Woolf, "The power of the past: history, ritual and political authority in Tudor England", in Paul A. Fideler, Political Thought and the Tudor Commonwealth:Deep Structure, Discourse, and Disguise, New York, 1992, pp.21–22. ^ Haddan, Arthur West; Stubbs, William, eds. (1868), Councils and Ecclesiastical Documents Relating to Great Britain and Ireland, I, Oxford (published 1869), p. 202 , in the footnote explanations. Merlin is a legendary figure best known as an enchanter or wizard featured in Arthurian legend and medieval Welsh poetry. The standard depiction of the character first appears in Geoffrey of Monmouth's Historia Regum Britanniae, written c. 1136, and is based on an amalgamation of previous historical and legendary figures. Geoffrey combined existing stories of Myrddin Wyllt, a North Brythonic prophet and madman with no connection to King Arthur, with tales of the Romano-British war leader Ambrosius Aurelianus to form the composite figure he called Merlin Ambrosius. The Battle of Badon was a battle thought to have occurred between Celtic Britons and Anglo-Saxons in the late 5th or early 6th century. It was credited as a major victory for the Britons, stopping the encroachment of the Anglo-Saxon kingdoms for a period. Annales Cambriae is the name given to a complex of Cambro-Latin chronicles compiled or derived from diverse sources at St David's in Dyfed, Wales. The earliest is a 12th-century presumed copy of a mid-10th century original; later editions were compiled in the 13th century. Despite the name, the Annales Cambriae record not only events in Wales, but also events in Ireland, Cornwall, England, Scotland and sometimes further afield, though the focus of the events recorded especially in the later two-thirds of the text is Wales. The Battle of Maserfield, was fought on 5 August 641 or 642, between the Anglo-Saxon kings Oswald of Northumbria and Penda of Mercia, ending in Oswald's defeat, death, and dismemberment. The battle was also known as Cogwy to the Welsh, with their countrymen from Pengwern participating in the battle, probably as allies of the Mercians. Bede reports the commonly accepted date given above; the Welsh Annales Cambriae is generally considered incorrect in giving the year of the battle as 644. The site of the battle is traditionally identified with Oswestry; arguments have been made for and against the accuracy of this identification. The flag of Wales consists of a red dragon passant on a green and white field. As with many heraldic charges, the exact representation of the dragon is not standardised and many renderings exist. Cadwallon ap Cadfan was the King of Gwynedd from around 625 until his death in battle. The son and successor of Cadfan ap Iago, he is best remembered as the King of the Britons who invaded and conquered the Kingdom of Northumbria, defeating and killing its king, Edwin, prior to his own death in battle against Oswald of Bernicia. His conquest of Northumbria, which he held for a year or two after Edwin died, made him the last Briton to hold substantial territory in eastern Britain until the rise of the House of Tudor. He was thereafter remembered as a national hero by the Britons and as a tyrant by the Anglo-Saxons of Northumbria. Historia regum Britanniae, originally called De gestis Britonum, is a pseudohistorical account of British history, written around 1136 by Geoffrey of Monmouth. It chronicles the lives of the kings of the Britons over the course of two thousand years, beginning with the Trojans founding the British nation and continuing until the Anglo-Saxons assumed control of much of Britain around the 7th century. It is one of the central pieces of the Matter of Britain. Cadfan ap Iago was King of Gwynedd. Little is known of the history of Gwynedd from this period, and information about Cadfan and his reign is minimal. Rhodri Molwynog, also known as Rhodri ap Idwal was an 8th-century king of Gwynedd. He was listed as a King of the Britons by the Annals of Wales. Caradog ap Meirion was an 8th-century king of Gwynedd in northwest Wales. Wales in the early Middle Ages covers the time between the Roman departure from Wales c. 383 and the rise of Merfyn Frych to the throne of Gwynedd c. 825. In that time there was a gradual consolidation of power into increasingly hierarchical kingdoms. The end of the early Middle Ages was the time that the Welsh language transitioned from the Primitive Welsh spoken throughout the era into Old Welsh, and the time when the modern England–Wales border would take its near-final form, a line broadly followed by Offa's Dyke, a late eighth-century earthwork. Successful unification into something recognisable as a Welsh state would come in the next era under the descendants of Merfyn Frych.